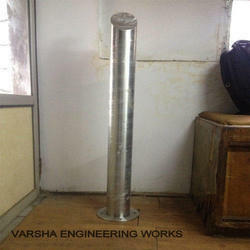 Manufacturer & Trader of Stainless Steel Bollard. Our product range also comprises of Fabrication & Maintenance Works, Rolling Shutters and Steel Railings. We are recognized as a successful manufacturer, trader and supplier of SS Bollard. We always ensure the on-time delivery of all of our products. These products from our side are made from high-quality stainless steel, which contains a high amount of chromium and nickel for the most effective resistance to wear and corrosion. These are used to create clean and bright accents to buildings and landscapes. These are made available to the customers at industry leading rates and as per the set industry standards as well. Our company has established itself as a leading manufacturer, supplier and trader of superior quality Stainless Steel Bollards in the market at present. These are made available to the customer at industry leading rates and as per the set industry standards. These come in brushed finished grade and we provide a contemporary design to all schemes. These products from our side is supplied with welded fixing spikes to ensure firm ground anchorage. As an ace manufacturer, supplier and trader of Stainless Steel Bollard, we have marked our name very strongly in the market. These come in brushed finished grade and we provide a contemporary design to all schemes. These products from our side is supplied with welded fixing spikes to ensure firm ground anchorage. These are used to create clean and bright accents to buildings and landscapes. These are made available to the customers at industry leading rates and as per the set industry standards as well.